Those of us who have experienced a chronic injury or who have a chronic illness are used to being treated poorly by others. You would think people would be more understanding, but apparently, that’s not the way it works. We all have war stories. We can all testify to the number of times we have been insulted, demeaned, overlooked, made fun of, criticized or not believed; all because of the way we look, act or function. What makes it so confusing and frustrating is that even though we know we don’t deserve to be treated this way, we’re not sure how to correct this situation. Typically, when an incident happens we react by getting confused, angry or defensive. We react emotionally; and that is understandable because being treated this way makes our blood boil. That helpless and frustrated feeling causes us to lose control and react impulsively, compounding the problem. I knew that, in my case, controlling myself in these situations would be really hard but essential, and I knew I had to find a way. I saw that how I responded in the moment, in my frustration or anger, was probably not going to educate anyone or make me feel better about myself. Something else important I saw was that, although what was said was directed at me, it really wasn’t about me. Maybe what was said was about some idea this person had in his or her head about people like me, or was said because something bad was going on in his or her life and it was making them frustrated or mean. Maybe their words had nothing to do with me. There is no quick comeback or witty response we can make that will make us feel better or magically change another person’s attitude. Probably, nothing we do in the moment will help them see us for who we really are. So, instead of getting defensive or yelling or arguing, we should try to look for an answer that is within us; something we have control over. We can start by calling these incidents what they really are: abuse. 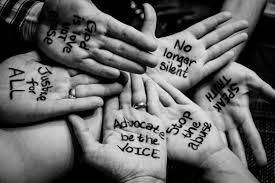 Abuse is never about the person being abused. Bad or improper treatment can come from many sources and appear in many ways. Bad or improper treatment is uncalled for, emotionally damaging, and it stops us from living our lives. This abusive treatment hits us at our core; minimizing what we have struggled through and what we continue to struggle with. If we all start by understanding that this kind of treatment is abusive and wrong and that it isn’t really about us, maybe we can find a way to deal with it. Maybe, accepting it for what it is, and giving it a name, will enable us to find our strength and deal with it better so that all of us survivors feel in control of our lives. While verbal or emotional abuse is never justified and is not acceptable, we need to understand that we cannot change the abusive behavior of others by reacting to what is said. Instead, we have to take care of ourselves by learning how to deal with the situation internally and not responding to the words. We want to respond. I know I did. I wanted to defend myself and fight back, but every time I did that I lost some of my strength and my dignity. So, I did my best not to react, and I tried my hardest not to take those words personally. I decided to maintain my strength and dignity by treating the other person better than they were treating me, even though it might hurt. By trying to be magnanimous and not falling into their abusive trap, I could maintain my strength and power, and I could walk away with my head high. Even though you may be hurting inside, you can be proud of the person you are, and you will be hurting less than if you had engaged in some kind of verbal battle which you can’t win. By doing this your power and strength can grow, as well as the ability to feel good about yourself, and you can be proud of the person you are; regardless of what anyone else says.